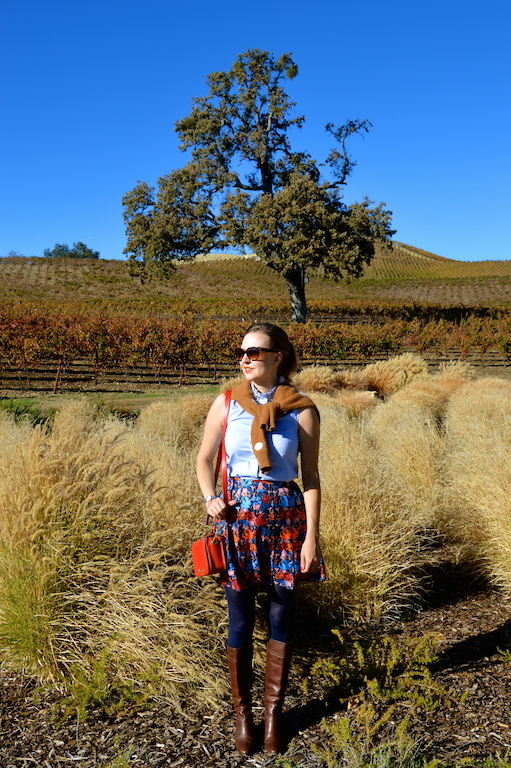 For the last two years, my husband and I have ventured up north to Paso Robles wine country before Thanksgiving. It's the perfect three day getaway. It's also a great opportunity to experience some excellent wines, not to mention the fall foliage and cooler weather that I miss so much due to living in Los Angeles. As you can see from the image below, between my leaf laden skirt and the light brown sweater I am sporting, I'm perfectly camouflaged among the fall foliage. After examining these pictures closely, I just realized that my sweater makes me look like a fawn due to its fuzzy texture and white spots. Now I know why mother nature selected that particular pattern for baby deer; it really is a great way to blend into the background! I will just warn you that several of my upcoming posts will all be about my trip to Paso Robles. I did something similar on my blog last year, chronicling each day we spent on the vacation and what I wore and what we saw. Blogging is a great way to catalog not only my wardrobe, but the beautiful places I've been fortunate enough to visit with my husband over the last few years. Before this trip, I looked back over at my blog and reminisced over last year's trip. Blogging truly is a great way to take a stroll down memory lane. Despite my earlier claim about the weather being cooler in Paso Robles, it did get rather warm on the full day we spent roaming around and wine tasting. Luckily, I wore a sleeveless shirt underneath my sweater, thus allowing me to don a sweater knotted over my shoulder to create a somewhat preppy look. Such a pretty look! I like a lot the combination! Thank you Minau! It's sort of an unexpected combo! Thank you Ada! Yes, Paso Robles is pretty great! It's a wonderful place to enjoy beautiful scenery and some great wine...what's not to love? Ooh that sounds like a fun trip--I love traveling vicariously through other bloggers :) This is such a fun print mix too, I love the colors and patterns together! Yes, it's definitely fun to travel vicariously to different regions through blogs. Thanks for stopping by to check out my little travel adventure! J. Crew for the win! 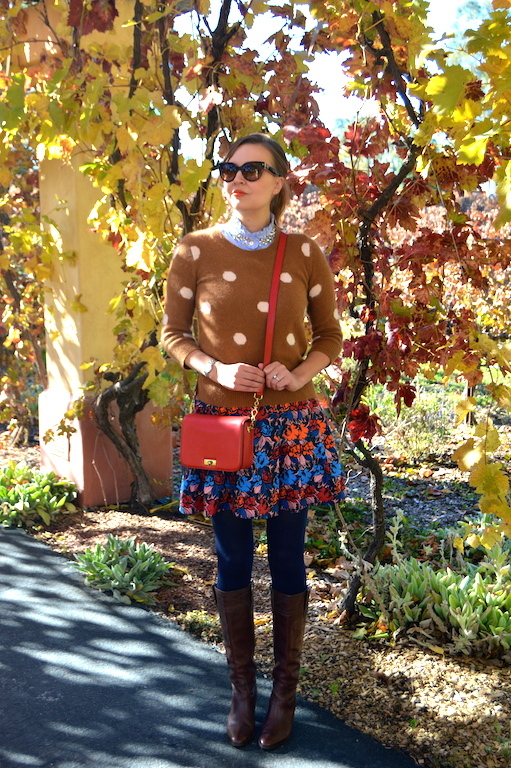 Love the wine country and the prints/patterns in this outfit! Yes, I'm all about J. Crew...almost as much as wine!Thanks for stopping by! Thank you! 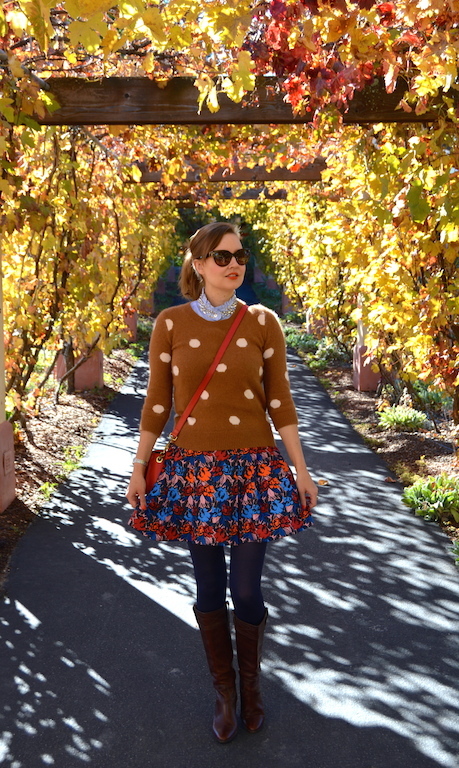 I just realized that my last outfit post also featured a polka dot sweater...clearly I can't get enough dots! SO pretty!! Love the look, and your pictures are gorgeous! Thank you! It was so easy to find beautiful scenery for some great pictures in Paso Robles. Perfect pattern mixing and a superb color palette in your outfit! I love every single piece alone and paired together! Enjoy your trip. Thank you! It's always fun to find unexpected ways to pair patterns together. Thanks for stopping by! Definitely spring for navy tights! They end up going with everything, plus they keep you nice and toasty warm in the fall. Also, as you can see this shirt gets a lot of use, so I highly recommend getting a bedazzled shirt too. Don't you just love how enabling looking at blogs is? I hope you also have a fantastic week Kim! Wow, such a pretty look! I would never have combined these two patterns, but you've shown how it totally works. You've inspired me to go back to my closet and see what unique combinations I can make too! Thank you! It was sort of a short in the dark combining these patterns together, but I think it worked out for the best. I'm sure you'll find something equally lovely in your closet to recreate a similar look! 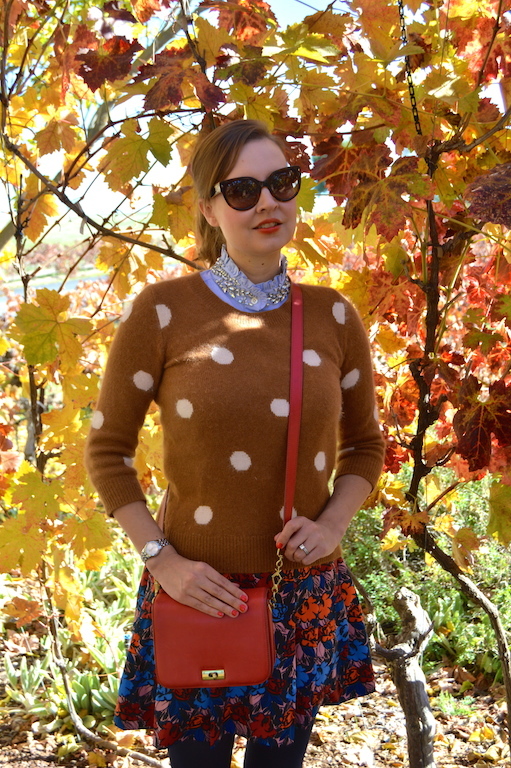 As someone who's just today done a post featuring a polka dot jumper, I'm sharing the love of the dots! Love colours from the jumper to the tights. Looking forward to more post about your trip. Thank you for linking to Rachel's Tuesday link-up. Petite Vix - co-host for this week. 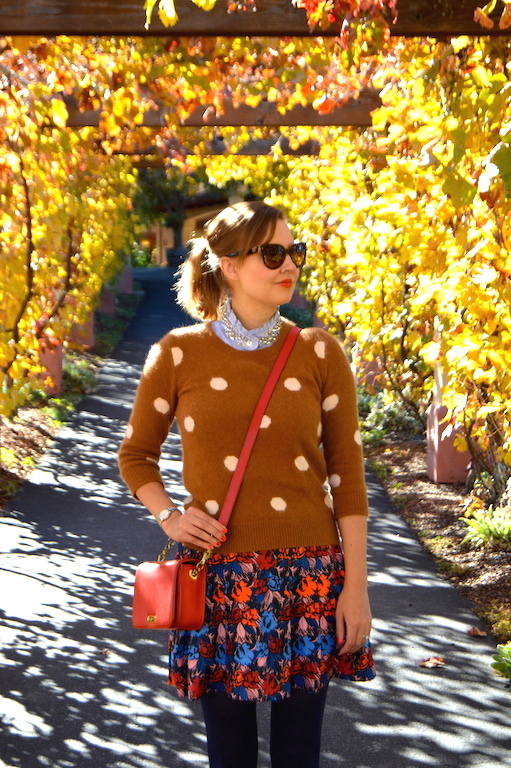 You've got to love polka dot sweaters! They seem to go with just about everything. Looks like you enjoyed some absolutely beautiful weather, and I'm swooning over your handbag! Love the fall pics and all of the fal colors in your outfit Katie, the blue tights look great with it Im a fan! I LOVE this entire outfit! This is one of the best and most beautiful pattern, texture mixes I've seen!